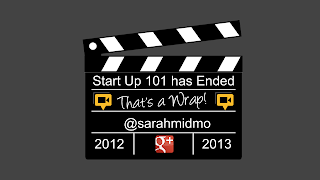 Start Up 101 with Sarah Hill has now ended. 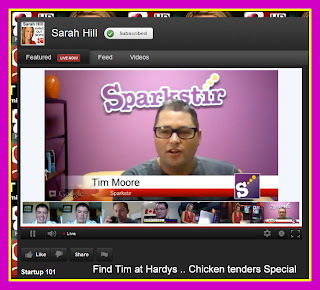 In this post, I'm sharing what I do as a Hangout Producer and what I learned. 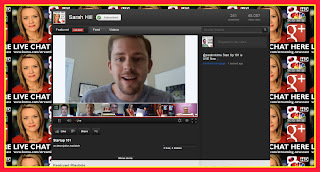 In this process, I used Google Plus, YouTube, Twitter, Facebook, Gmail, Chrome and Google Picasa. Here's a Timeline Narration. I'm sat at my laptop.. constantly refreshing the g+ stream. I spotted the LIVE Feed for the show (at this stage I had no access to any privileged info, just the stream). I want to get the LIVE Player shared as fast as I can, by clicking the YouTube Channel Feed icon. where evrFtZgcSSk is the important part I need. 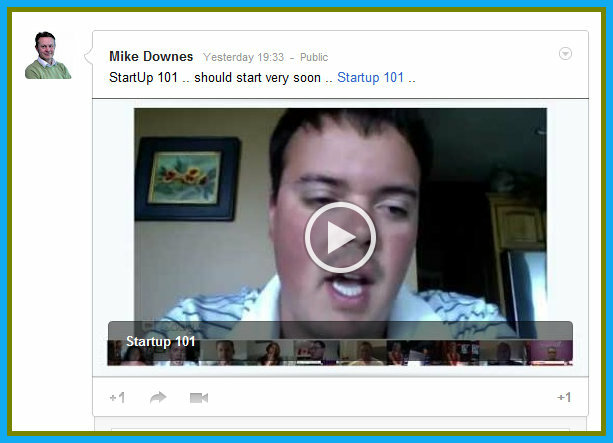 I posted the new link in my stream, Start Up 101 should start very soon. At that point, the link was a link, but after the show started, it sprang to life as a mini player. 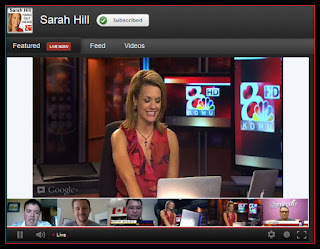 A few seconds later, the show started and it was a nice surprise to see Sarah's Channel was redesigned with a dark grey background with reversed out white text. I have connected my Twitter and facebook accounts to my YouTube Channel connect, so every time I made a YT comment it arrives on my Twitter and facebook streams. That was the next job, telling people it was LIVE. While all this is going on, I get a shout out from Sarah to direct comments to me (and Kempton Lam). At this point, I'm thinking keep a close look at the YouTube, Google Plus and Google Events streams. And yes, Michael Tucker made a good point about having a prepared hashtag for the event. For whatever reason, we slipped this by (no idea why). The previous G-10 we had used Google Moderator (and Google Events for the first time). For an active event like this, photographs are essential, so I began quickly taking screen shots of the guests. I use Google Picasa (open in the background), so when I hit print screen, I get a pop up and click the image (you can see a few screens shots on this page). I have used crop, add border, save. For Suite 709, I used the Orton Effect. What you will notice is adding photos to an event is easy, but does not cross post every photo in your own stream, just one album title (which appears at the timestamp of first posting). Each time you add a slide, it auto updates. In the G Event, we have photos and anyone is allowed to comment. I posted two standalone screen shots just to make sure. While all this was going on, I had eight of nine Chrome tabs open, while checking them all at the same time and listen in to the discussion and trying to respond to that. 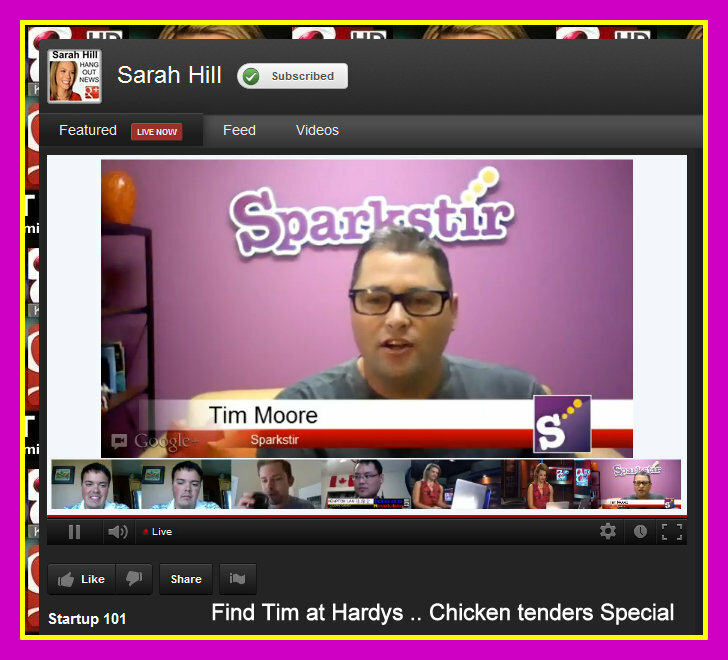 One unexpected theme was Tim Moore referring to working at Hardee's serving chicken tenders (if his start up failed). Great moment, but one that needs a stream response quite quickly (notice the caption on the slide, with incorrect spelling). 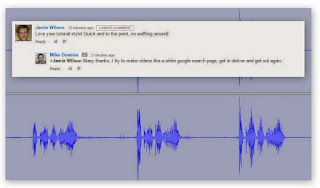 You will also notice, YouTube Comments have a standalone URL (if needed): http://www.youtube.com/all_comments?v=evrFtZgcSSk This helps to slip a vertical stream somewhere on your screen without being too big and taking up too much space. There were 41 comments at YT and another 25 comments in Sarah's stream (mini-player). 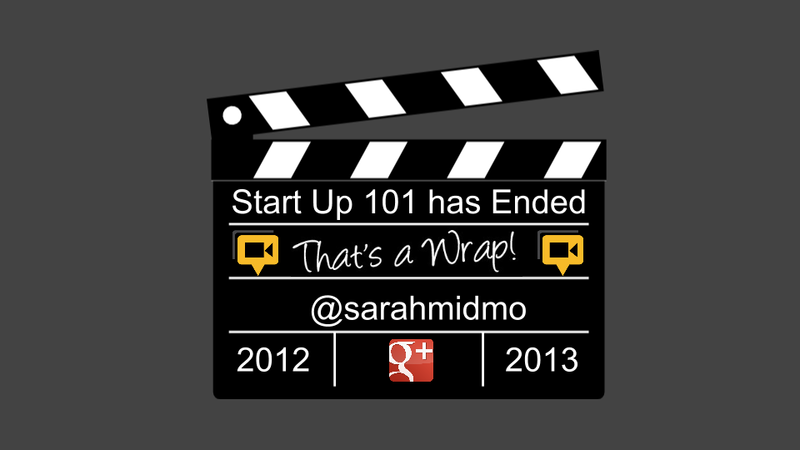 The Event Page had about 85 comments/interaction and was ended with my slide saying, That's a Wrap. After the HOA was over, Sarah went to work re-titling the broadcast, writing a description, adding attribution, links, tags and checking for a suitable thumbnail. Sarah then reposted in her stream with more text. Meanwhile, guests thanked each other while swapping contact details. By this time, YouTube had produced an interactive machine transcript. This will not be perfect at all, but will serve as a later edit to download the file, edit and re-upload for perfection (if required). All this happened in 26 minutes and 1 second. There are many parts I left out, I'm sure. One tip is to get the LIVE HOA Player embedded in the Events Page. It did not happen this time. Tips for the future. For me, understand that the audience will wander and do not tell them to be in just one place. Anyone who tries this, is making a big mistake. An HOA is like a party popper exploding confetti in the air, it will reach parts you never knew existed. Or even thousands of tiny boomerangs, but expecting them to return to you is futile. The audience is clever and may be watching on big screens, small screens and the crafty screens tucked sneakily behind an office spreadsheet, so the boss cannot see. We are determined to get better at Hangouts On Air. If you have any questions or suggestions, let me or Sarah Hill know. So you have an idea. How do you find funding for it? Startup 101: You have an idea. How do you get funding for it? This Google Plus Hangout On Air hosted by KOMU's Sarah Hill had panelists including Chris Guillebeau who's most recent book is the "100$ Startup", Brent Beshore, a serial entrepeneur and owner/CEO of AdVentures, Tim Moore of Sparkstir and CrushIQ and Terry Roberts, CEO of Picsure. In the discussion, guests answered questions about how do you deal with roadblocks, where to find money beyond banks and how sites like Indie Go Go and Kickstarter have changed the startup business. Thanks for the write up of your 'behind the scenes' experience here? Great Question.. Kempton was the guy on the inside of the hangout.. I will ask him if he used it. And will post you at g+ ..